The most common reasons for mulching are preventing moisture loss, weed prevention, control soil temperature and aesthetics. River rock heats up soil but is effective at retaining moisture. Rock works well at controlling many weeds when laid above a weed barrier. Wood mulch gradually releases nutrients into the soil as it decomposes and improves drainage. It prevents frost damage to certain plants and cuts down on weeds while making them easier to pull. River rock presents a higher initial cost than wood mulches but is permanent, whereas wood mulches should be reapplied yearly. 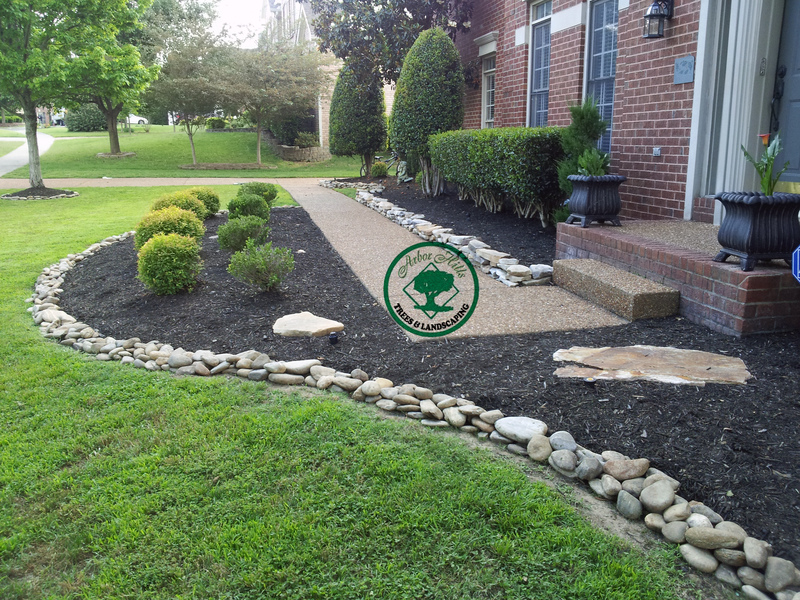 Lay landscape fabric below the rocks to block weeds. River rock mulch is difficult to move, so installing it is a permanent decision. Wood mulch is more inexpensive by the yard. Although it must be reapplied, it constantly adds organic matter and minerals to the soil, and can be left as is when changes are made in the garden. River rocks are best used in environments with little rain and plants that don’t need large amounts of water. The landscape fabric and unamended soil below often result in poor drainage, which causes root rot. Drip irrigation provides regular, small amounts of water. Wood mulch is an excellent choice for moisture retention. As it decomposes, it adds humus to the soil, which improves drainage and water retention. Multiple layers of landscape fabric combined with river rock are great barriers against most weeds. Aggressive perennial weeds may still be able to break through, making weeding difficult. Mulch will not create as strong of a barrier but reduces small weeds and makes large weeds easier to pull. In time, mulch and manual weeding significantly reduces the weed population.